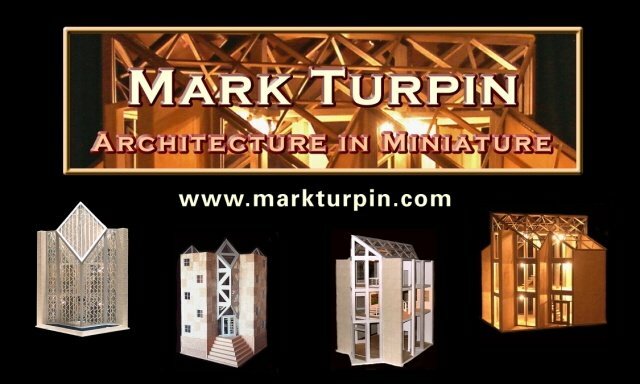 To bring diversity to her growing collection of fine art, a California realtor commissioned Mark Turpin to build a classically detailed miniature structure. The piece was intended not only for her personal enjoyment, but also to be displayed for viewing by clients who tour new model homes on the California coast. In a world where peace is sometimes hard to find, Chardin is intended as a haven for quiet reflection. Named for the 18th century French painter Jean-Baptiste-Siméon Chardin, this small domed retreat is reminiscent of the quiet intimacy of the artist's lovely paintings. His aristocratic patrons included Louis XV, but Chardin, who was mostly self-taught, focused his work on common subjects and themes. One century later, another Frenchman, Pierre Teilhard de Chardin, offered philosophical insight for those who love to contemplate life, nature and its wonders. To that end, Chardin is designed as a refuge of calm repose, perfect for reflection and meditation. Construction is solid pine with a painted faux stone finish. The base is 15" in diameter, and the glass dome with finial reaches 22". Certain details connect this piece to Mark Turpin's Chaumet, including the stained glass window below the opaque dome and the mirrored floor. Chardin features a clerestory below the dome, its openings covered by elaborate, decorative bronzed grilles. Eight delicate wall sconces handmade by J. Getzan feature reflective mirrors and crystals, bringing a warm glow to the interior. Handmade windows and French doors, with German hardware, complete the deluxe appointments. Sold. Chardin was featured in the March 2007 issue of Dollhouse and Miniature Scene magazine, and in the June 2007 issue of American Miniaturist magazine.